Apple Fun Creative Paper Quilling A To Z Collection Brand- Applefun Age Group 6 Years + High Quality Brass Pin Quilling Tool Multicolour Quilling Strips (Approx 200) High Quality Non- Toxic Craft Glue. 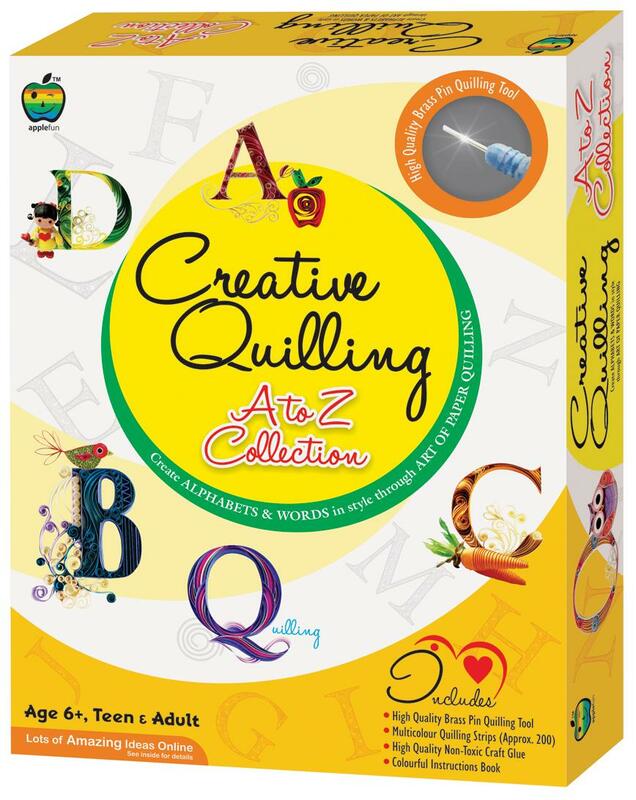 Colourful Instructions Book Dimension Box:- Height In Cms 30 Length In Cms 23 Width In Cms - 6 Weight In Gms 530Gms Description:- The Creative Quilling A To Z Collection Is The Product Of Apple Fun. This Kit Guide The User In The Art Of Rolling & Shaping Strips Of Paper Into Beautiful & Delicate Looking Shapes & Patterns, Famously Known As The Art Of Paper Quilling . This Is The Product For Age Group Of 6 Years + Childrens. Open The Box & Create Amazing Artworks With Simple Strips. Create Alphabets And Words In Style Through Art Of Paper Quilling.Lot Of Azaming Ideas Online. Create 3 Dimensional Designs 3D The Product Brought To You By DealBindaas.Com A Unit Of Lehar Webstore Pvt Ltd Brings To You An Assortment Of Learn And Play Games That Are Made Of Durable Material With Fine Work Of Detailing And Great Visual Appeal. This Collection Of Products Aims To Allow Your Child To Explore New Thing By Do It Yourself Kits With Their Pals And Parents. Create Memorable Times Beyond The Vicinity Of Your Home.Improve Coordination In Kids. Helping Your Little Ones Grow Independent Indulge In These Powerful Games And Enjoy Sheer Thrill And Action Packed Activity Games. Bring Home These Products And Watch Your Kid Jump With Joy!